Until March this year, the camp in Preševo was the entry point for thousands of people from Macedonia into Serbia on their way North. Now, it turned into the opposite: the last stop in Serbia before people are pushed back south, to Macedonia. For several weeks now, the Serbian police has been bringing people on the move to the now closed reception centre in Preševo. These are people that have been staying in camps in the North before, for example in Subotica and Sid as well as in Belgrade. Many people have launched their asylm process in Serbia. Nonetheless, they are pushed-back by the Serbian authorities. It is reported that the Serbian authorities destroies their asylum papers in order to destroy all prove that these people have been in Serbia before. The push-backs are against the all international conventions and violate the asylum right of these people. The push-backs appear to happen in large numbers to make space in the reception centres, as Serbia has not enough spaces in reception centres for all the people currently stranded in Serbia. Except for few unaccompanied minors and families all people who are brought to Preševo camp are subsequently pushed-back to Macedonia. Those vulnerable families and minors have been transferred to a new camp in Bujanovac, 20km north from Preševo. Rund 100 Flüchtlinge sitzen nach einem 120 Kilometer langen Fußmarsch bei klirrender Kälte an der Grenze zwischen Serbien und dem EU-Land Kroatien fest. Die Flüchtlinge, vor allem junge Männer aus Pakistan und Afghanistan, hatten sich am Freitag in der serbischen Hauptstadt Belgrad auf den Weg zum Grenzübergang Sid gemacht. Serbische und kroatische Polizisten hinderten sie am Montag jedoch daran, über die Grenze in die Europäische Union zu gelangen. Male migrants are piling up in Belgrade, unable to get into the camps or leave the country – while a ban on NGOs giving them food has made their plight even grimmer. This report describes the violence of the border regime erected and fortified as part of the gradual closure of the Balkan corridor since the end of 2015. A bit more than one year ago, the Hungarian government finished constructing the fences along the Serbo-Hungarian and Croatian-Hungarian border, and a bit more than 6 months ago the entrance to the Balkan corridor at the Greek-Macedonian border in Idomeni was closed completely. The logic and consequences of the closure of flight routes manifest themselves in the daily violence of the border regime and its zones of control and coercion. 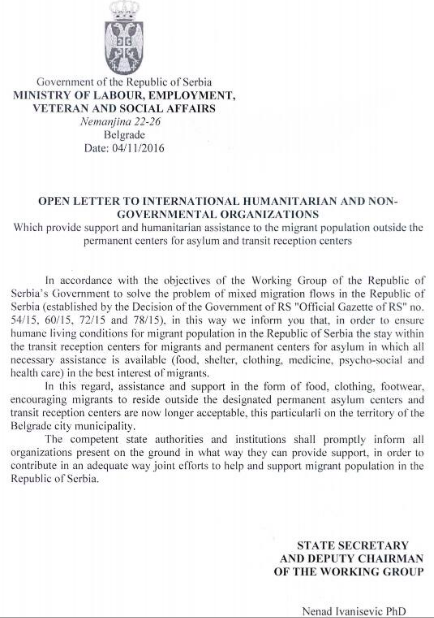 The government of Serbia has asked all NGO and volunteers to stop providing all services to the 1,200 refugees stuck in belgrade Serbia. They have announced that their goal is to get all refugees/migrants living in Belgrade into camps, as soon as possible. More than 300 migrants in Belgrade marched toward Hungary’s border with Serbia on Tuesday, appealing for European nations to let them in. An estimated 6,000 people are stranded in Serbia due to the border closures, most of whom fled countries such as Afghanistan, Iran and Syria. Though Hungary currently admits around 30 people per day from Serbia, most refugees and migrants are essentially gridlocked, with nowhere to go. Since the 15th of July, the day that prime minister Aleksandar Vučić held a speech  about the problems Serbia is facing at the moment, the situation in Serbia for people on the move has become more and more tense. The speech was an awaited response to the legal changes made in Hungary on July 5th (“8 kilometer” push-back law ) which set a legal frame for the Hungarian authorities to push back thousands of people to Serbian territory. Among other points, Vučić mentioned in his speech that migrants are one of the biggest problems Serbia is facing at this time and that more repressive measures will be taken in order to gain control over the irregular movement of people. One of the measures put into practice has been a “joint venture” of police and military in order to guard the southern borders towards Macedonia and Bulgaria. As of August 30, 4,428 people have been kept from entering Serbia by military and police units, while within the same operation 673 who were encountered on Serbian territory have been brought to official reception centers. The military officials don’t use the word ‘push-back’ or mention any direct contact with the groups, rather they state that people “gave up” when they saw the Serbian forces. Thereby, Serbia maintains its humanitarian vocabulary used to distinguish itself from other Balkan countries like Hungary and Macedonia who boast with numbers of people they successfully pushed back. Which methods were used to deter people and why these 4,428 people did not apply for asylum in Serbia but instead went back is not mentioned. Probably the mere sight of a police officer is not enough to stop people from moving on, yet their stories and voices remain silent and invisible. On the one hand, this increasingly repressive policy changes can be seen as a national answer to the reality that was created by the northern neighbour Hungary and to the fact that from one day to the other people got stuck in Serbia with no option to move on. On the other hand, these changes can also be seen in the frame of a European Border Regime that consists of more than just the legal closure of European borders. This will be elaborated in the following. Number of refugees arriving to Serbia increases every day. All of them are passing through the Balkan Route, being exploited by smugglers, forced to hide from the police, humiliated, but full of hope to reach their final destination. Along the way they are met with many volunteers who are doing their best, despite numerous obstacles, to help those who are in need. Serbia is not final destination for most of the refugees, but facing closed borders they are forced to wait. AYS volunteers team gathered information about situation in Serbia, pointing towards some of the most urgent issues and problems refugees but also volunteers are facing daily. Conditions for people on the move in the unofficial camps at the Hungarian border get worse with approaching colder periods. Still, people face long waiting periods and provided aid is insufficient. Officials expect people to stay in the country for longer time.